With five studio albums since the band released their self-titled debut in early 2003, melodic metallers MASTERPLAN are set to unleash their first ever live release on October 9th. Check out the first taste with the official live clip of “Spirit Never Die” on KNAC.COM right HERE. 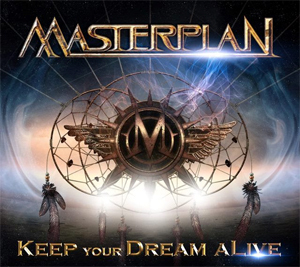 Keep Your Dream aLive will be available as DVD/CD and Bluray/CD sets, both including the entire show from Masters Of Rock festival, recordings from Wacken Open Air, footage from the band's latest Asian tour and ProgPower USA, as well as all (five) official MASTERPLAN video clips. The Masters Of Rock show is featured on the CD. MASTERPLAN will tour Latin America in October.